This simple rosé cocktail is the perfect summer sip. 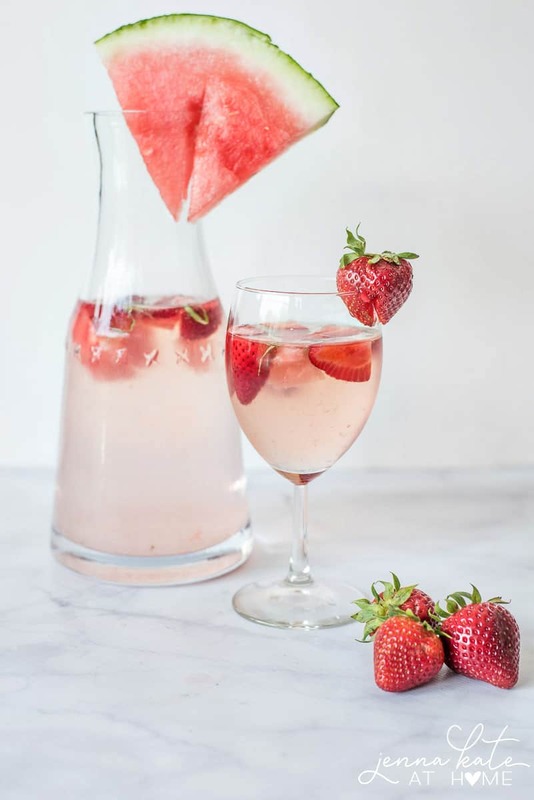 With the delicate flavors of strawberry, watermelon and a hint of basil, you’ll be tempted to keep the entire pitcher for yourself! I recently discovered this Strawberry, Basil & Watermelon Rosé cocktail at a local bar and I was hooked. I’m not a big drinker – in fact, I can count on one hand how many drinks I’ve had in the past 3 years but I really enjoyed this one and so took it upon myself to recreate it at home. This ended up being a really easy cocktail to make so it’s a great one when for when you’re entertaining. By the way, do you remember the salad I recently made that has the same base ingredients as this drink? You guessed it – I was inspired to make it right after having this cocktail! Looking For More Cocktail Ideas? While this cocktail is almost technically a sangria, the addition of the vodka kicks it up a notch into fruity summer cocktail territory. The other ingredients you’ll need for this rosé cocktail are simply the rosé wine, strawberries, watermelon and a bit of basil. The basil is not completely necessary but really adds a wonderful fresh taste to the drink. Not only is this drink delicious but I think it may in fact be the perfect summer sip. Not so fruity that serious wine lovers won’t enjoy it but fruity enough that those of us that don’t love alcohol will be happy. 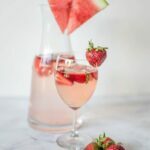 This Rosé Cocktail is made using strawberry vodka but you could use plain vodka and add a strawberry simple syrup to enhance the flavor if you’d prefer. You could even try it with a basil or watermelon simple syrup if you prefer that flavor profile! This delicious summer rosé cocktail features the delicate summer flavors of strawberry, watermelon and a hint of basil. The cocktail is kicked up a notch thanks to the addition of vodka. Combine the strawberries and watermelon is a blender and pulse until pureed. Add the chilled rosé and vodka. When ready to serve, add the chopped basil and the reserved strawberries. Stir to combine. Serve over ice.